My rating: 9/10. Excellent watch. Value for money. Today I’m doing a Seiko 5 SNK809 review. 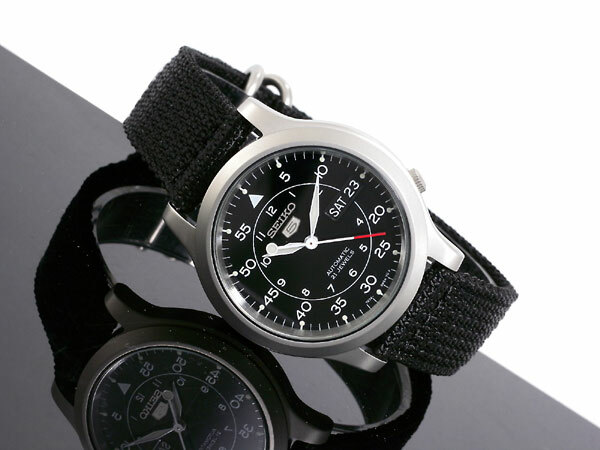 The Seiko SNK809 is part of Seiko’s extremely popular Seiko 5 series. These watches were designed to set the standard for affordable quality in watches. 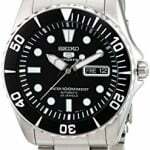 Seiko 5 was born in 1963, they wanted to offer accessibly priced mechanical watches, they combine an automatic movement, 3 bar water resistance, and a one-level day and date display in a single window. A lot of Seiko 5 watches feature this unique position of the crown where it’s tucked behind the 4 o’clock position. 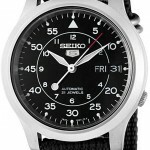 They were an instant success and to this day Seiko 5 watches offer that same value for money. You’ll see from this Seiko 5 SNK809 automatic review that the watch stands by its values and offers great value for money with excellent design, which has no doubt been the reason for its huge popularity among Seiko watch fans. First off we’re going to take a quick look at the general watch specifications of the Seiko 5 SNK809. This allows you to quickly grasp some of the important details of the watch before we later go into deeper detail about the watch as a whole. It’s safe to say that the Seiko 5 SNK809 isn’t one of the most stunning looking watches. I don’t think I’d wear it to any serious formal occasions myself, but I would be more than happy to wear it as a day to day watch. While I do love the design of the dial, fabric straps aren’t something I’d personally go for, that being said I fully respect that they are still very popular. Seiko watches are known to be built to a very high-quality level. In my experience, I’ve never had a problem with any of the Seiko watches in my collection, with proper care you can expect your Seiko watches to last an extremely long time. It has a simple uncomplicated design to it, getting back to the basic of watch craftsmanship which is nice to see. The dial design of the SNK809 does have a smart feel to it, everything looks very organised and it utilises luminous markers every 5 minutes that make it extra easy to read in dim lit conditions. I do love the idea of having the 5-minute intervals and the hour dual displayed, it’s something I don’t see done very often. Unlike many watches you see around these days, the SNK809 isn’t huge, it’s perfect for people looking for a watch that suits smaller wrists. The case diameter is 36mm so it’s fairly smaller than these 42mm watches you see around. So for people who’ve had enough of large watches not sitting right for them, give this watch a chance. As far as thickness goes, it’s rather modest with an 11mm case thickness. The watch has a rather flat finish to it so it sits quite nicely on your wrist. This Seiko features Hardlex glass, this is a type of mineral glass that is specially hardened to be highly resistant to knocks and scratching. It was developed by Seiko for use in their Seiko, Pulsar and Lorus watches, it’s similar to mineral glass and basically their own take on this type of glass. It’s exactly what I’d expect to find in a watch in this price range so I’m very pleased with that. The next step up would have been sapphire glass which is scratch proof rather than the scratch resistant you see in Hardlex crystal. Due to the price of sapphire glass though you only really see it on premium watches. 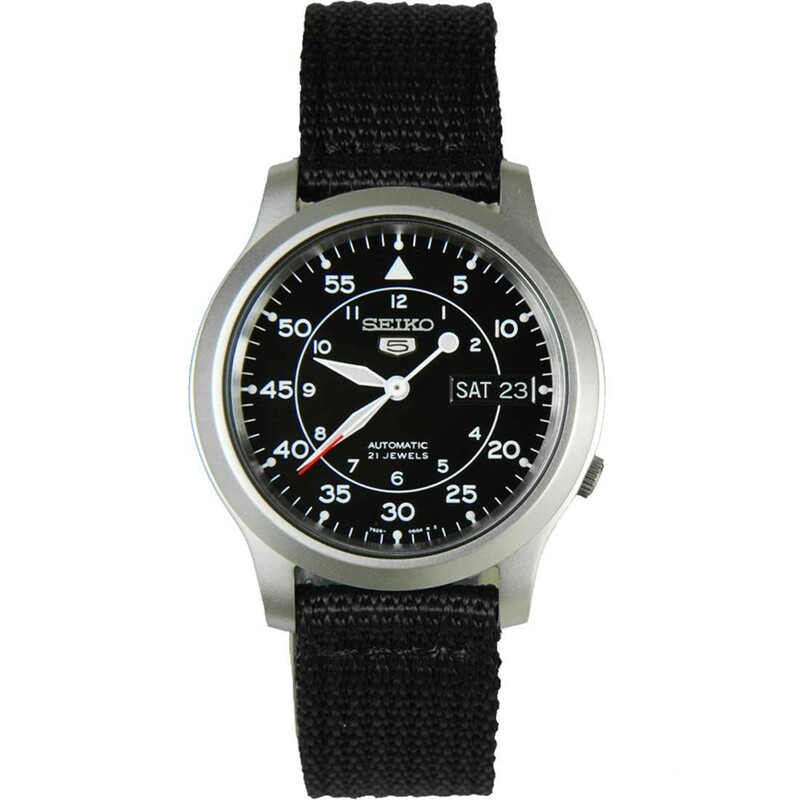 The Seiko SNK809 features a water resistance of 30m or 3 bar if you prefer reading it that way. 30m water resistance isn’t much, but I don’t expect you’re going to go all out diving with this style of watch. Wikipedia’s example of what 30m water resistance offers you in ‘suitable for everyday use. Splash/rain resistant. Not suitable for showering, bathing, swimming, snorkelling, water related work and fishing.’ The thing with water resistance testing is that it’s done in a still environment with no added pressure. So 30m resistance doesn’t mean you can take it 30m deep. The very motion of moving your arm would increase the pressure forced upon a watch greatly from that that it would experience just submerged. So there you have it, the Seiko SNK809 is fine for everyday use, and can resist splashes and rain. Just don’t go using it for anything else. And remember you should never submit a water to hot water, it varies greatly from that of normal temperature water as far as testing goes. A feature that I really love about this watch is its case back, many automatic watch fans love to be able to see their automatic watch movements in motion. The SNK809 features an exposed glass case back which makes the movement easily viewable. It’s quite fun every now and then to take off your watch and just watch that gears go round. While it is classed as an undecorated movement, I’m sure you’ll agree from looking at the picture below that it’s still very pretty to look at. 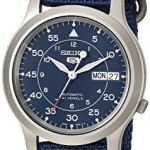 I mentioned earlier in our specifications section that the Seiko featured a Seiko 7S26 movement. The Seiko 7S26 automatic movement is basic 21 jewel style movement. In comparison to other automatic brands, it would be fair to say the 7S26 is a fairly basic movement. 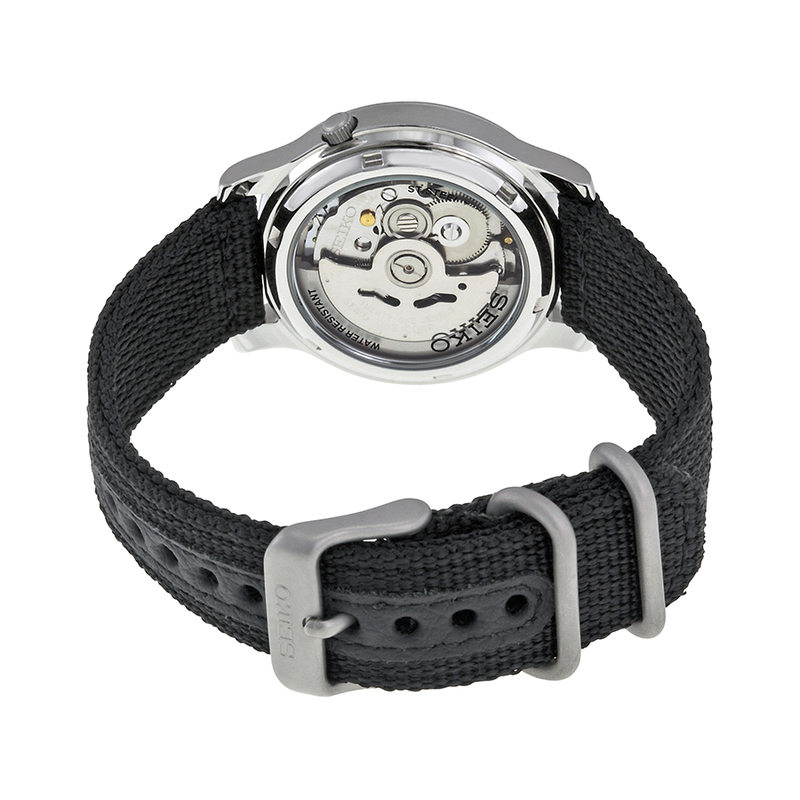 It doesn’t feature hand winding or hacking however it is a very affordable movement that is extremely reliable. It’s always worth remember we’re looking at a high-quality Seiko watch for a very fair price. Over the course of a month, you could expect to gain or lose about 1 or 2 minutes. But when you think about it this shouldn’t be too much of a big problem. Like many other watches, the Seiko SNK809 has a basic calendar, this means that it can’t adjust for the varying amount of days in a month. So you’re likely adjusting the date at the end of the month, this would be a perfect time to adjust your minute timer to bring it back in line again. Personally, I don’t expect automatic movements to be extremely accurate, time deviation is to be expected in most automatic watches be it Seiko or some other brand. So I would never let something like this put me off going for a watch like this. I figured I would take a look at some of the pros & cons of the Seiko SNK809 and display them in an easy to read format for those of you who love to skim read, I got your back. 30m water resistance isn’t very high, it’s suitable for day to day use but you can’t go swimming etc with it. You can expect to loose around 1 minute per month in accuracy, however, this is easily sorted when you adjust the date. So there you have it, a fairly detailed look at the Seiko SNK809. You should be able to get a fair grasp of why the Seiko SNK809 has been one of the most popular watches for Seiko, it offers a great quality build at a very accessible price range. While I’m not a fan of the black canvas strap, with the ability to easily change the strap I’m sure I could find something a bit more me to add to it. Overall I highly recommend the Seiko SNK809, and it deserves it. We took a look at some of the watches benefits and highlighted some of the negatives associated with it but I feel it still whole heartedly deserves the 9/10 that we’ve awarded it. I’d recommend buying the Seiko SNK809 from Amazon here, it’s been a big seller on Amazon and has lots of reviews from other buyers available for you to read through as well. Amazon offers great customer service and Amazon Prime customers can get their watch within a day. I hope you enjoyed having a read through of this extensive Seiko SNK809 review. As always let us know in the comments what you thought. This is a really great detailed review. Keep up the good work. This is one of the best Seiko 5 automatic reviews that I’ve read in a while. I think the Seiko SNK809 is one of the best, of course you could always consider one of the colour variants. I think they’re the same apart from the colour of the straps pretty much. I’ve owned a Seiko SNK809 for a few years, it’s been my trusty go to Seiko 5 for a while (I collect Seiko watches). If anyone is looking for a starter watch that’s affordable, I can recommend this model.